Spacewalker Nick Hague works to upgrade the International Space Station ‘s power storage capacity during today’s six hour and 45-minute spacewalk. Expedition 59 Flight Engineers Nick Hague and Christina Koch of NASA concluded their spacewalk at 2:27 p.m. EDT. During the six hour and 45-minute spacewalk, the two NASA astronauts successfully connected three newer, more powerful lithium-ion batteries to replace the previous six nickel-hydrogen batteries that provide power for one channel on one pair of the station’s solar arrays. The new batteries provide an improved and more efficient power capacity for operations. 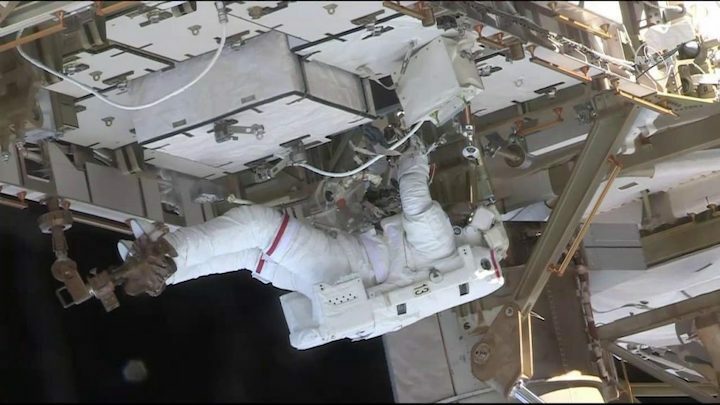 The astronauts also did work to enable robotic specialists to remove one of the three new lithium ion batteries connected during last Friday’s spacewalk that is not charging properly and replace it with the two older nickel hydrogen batteries. The swap will restore a full power supply to that solar array power channel. In addition, the astronauts also completed several tasks to prepare the worksite for future spacewalkers who will complete similar operations to upgrade the batteries for the set of solar arrays at the end of the port side of the station’s backbone structure known as the truss. Hague inspected the worksite interfaces for a portable foot restraint a spacewalker uses to anchor themselves during the battery upgrade work while Koch installed fabric handrails to help future spacewalkers move across the worksite. This was the second spacewalk for Hague, who now has spent a total of 13 hours and 24 minutes spacewalking. It was the first spacewalk for Koch, who became the 14th female spacewalker. Anne McClain and David Saint-Jacques of the Canadian Space Agency are scheduled to conduct another spacewalk April 8 to establish a redundant path of power to the Canadian-built robotic arm, known as Canadarm2, and install cables to provide for more expansive wireless communications coverage outside the orbital complex, as well as for enhanced hardwired computer network capability. Experts will discuss the work to be performed on the April 8 spacewalk during a news conference at 2 p.m. EDT Tuesday, April 2, at NASA’s Johnson Space Center in Houston. Live coverage of the briefing and spacewalks will air on NASA Television and the agency’s website. Participants in the briefing are Kenny Todd, International Space Station manager for Operations and Integration, Rick Henfling, spacewalk flight director, and John Mularski, lead spacewalk officer. Space station crew members have conducted 215 spacewalks in support of assembly and maintenance of the orbiting laboratory. Spacewalkers have now spent a total of 56 days 4 hours and 24 minutes working outside the station.